Eldfast is a ceramic material composed of two materials (1) a refractory ceramic aggregate in powder form (2) a resin bonding agent, when mixed together create a slurry. A sponge plug is drawn up the chimney using a winch while the mixed material is poured in slurry form onto the top of the sponge plug, this is continued to the top of the chimney, the process can be repeated a number of times until the operative is satisfied a full lining is achieved. 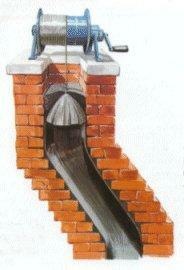 A certain amount of preparation is required, A clean chimney is required, this is achieved by cleaning with stiff wire brushes, If however more cleaning is required a flail is used, This devise has a spinning chain which is drawn up the chimney a number of times if required to get the chimney as clean as possible. In the area where I operate this method is generally used in the repair of defective cast in situ linings or the repair of clay liners, previous repairs required for these type of linings required the digging out and relining using the Cast in situ, naturally the ceramic lining is more cost effective and very little disturbance to the fabric of the property and has been tested up to temperatures approaching 2000 degrees centigrade. On completion the client is advised to refrain from using the appliance/fire for a minimum of 48 hours, after this period a small fire can be lit for a further 24 hours after that period the fire/Appliance can be used as normal.